I have to admit something. I’m conflicted by a couple of pieces of economic data that leave me scratching my head. Though many analysts and market commentators tend to focus on things like unemployment data (I tend to ignore it from the standpoint that it isn’t a leading economic indicator but rather a lagging one) or reported GDP growth (it too is a lagging indicator), I see a bunch of mixed signals with what I typically see as leading economic indicators. Clearly, we see a negative and protracted situation with regard to consumer spending, which comprises 70% of overall GDP. (See our earlier post on that topic). But on the flip side, many indicators look quite positive. Let’s take a look at some of those. But let’s not stop there. 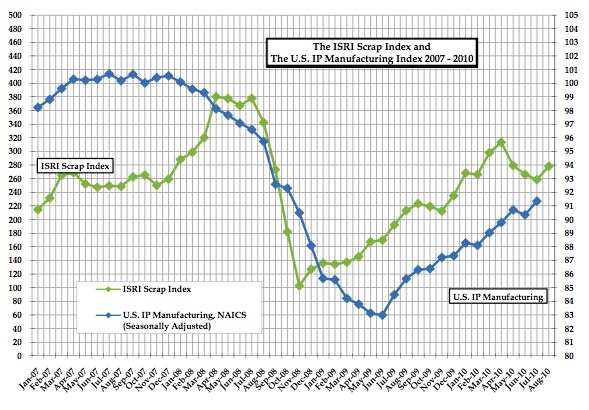 The latest ISRI Scrap Index shows an uptick, led by copper scrap and HMS. Furthermore, ISM data looks quite positive, even surpassing expectations as the overall manufacturing index moved from 55.5 in July to 56.3 in August, exceeding analysts’ expectations. In addition, production bumped up 2.9% from July combined with steady price increases. ISRI also reports positive euro zone numbers for industrial production growing 2.5% from May to June. 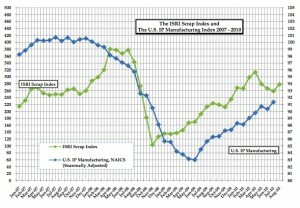 However, the ISRI did temper its own data by acknowledging that the pace of growth will not likely continue. Last, the ISRI reports an uptick in the China PMI from 51.2 to 51.7. So all in all we can interpret this quite positively and that may be what Brian Beaulieu has seen as well (we reported his claim of having a very good track record of successfully predicting economic growth or lack thereof – he does not see a double-dip for 2010). And as we like to point out, Alan Greenspan often looked at scrap markets for signs and direction as to the overall economy. Here the data also seems to support upward price momentum. Goldman Sachs has recently called for higher steel prices on the back of higher scrap prices and higher iron ore prices. According to the ISRI, No. 1 HMS increased by $37/ton compared to July and some are calling for more price increases for shredded scrap due to overseas demand. All of these indicators would suggest steel prices remain supported, despite subdued domestic demand. On the non-ferrous side, the ISRI reports less momentum for prices for both copper and aluminum even citing aluminum producer Rusal as holding prices stable for the balance of the year. Midwest aluminum premiums have also eased a bit, according to the ISRI. Anecdotally, we know of some major corporations that have indicated greater growth during the second half of this year than during the first half. Some steel producers have seen larger order books as well. Will the manufacturing sector keep the US economy out of recession by the time mid-term elections roll along? Stay tuned. September 30’s revised Q2 GDP numbers will provide the first indicator. By the way, we’ll be at the ISRI Commodities Forum next week in Chicago from September 13-15. If you will be there, please find us and say hello. We’d love to hear meet you! How Much of a Cut is China's Steel Production Cutbacks?